Perhaps you’re reading this coming up on your first set of uni exams. Perhaps you’re a veteran. Probably, you’re somewhere in between, and you might be starting to form your own particular strategies for uni exams. When I was in uni, I had a pretty consistent strategy going into the end of each semester. Hopefully, it helps you out! Here’s my advice. Work out what grade you’re sitting on. Unlike high-school, where final grades can be rather unpredictable, the nature of university assessment gives you a great chance to work out exactly what your current grade is up to that point in the semester. Some people might prefer to remain ignorant of their current grade as a deliberate mental strategy. If you’re in that group, power to you! Other people might love to know what grade they’re sitting on. If you’re in that group, read on: I’m about to tell you how. Virtually all university courses have assessments within the semester, and you should have your marks back by the time you reach exam period. Working out what grade you sit on is as simple as multiplying a given assessment’s mark with that assessment’s weighting, doing that for all your assessments, then adding all those numbers together. Let’s have a look at an example. We can work out your current score with the following calculation: (64*.10)+(83*.20)+(71*.30), which equals 44.3. So, your current grade out of 60 (because you’ve only done 60% worth of the subject’s assessment), is 44.3. As a percentage, 44.3 over 60, multiplied by 100, gives us 73.83% – your current weighted average for this subject. Now that we have your current grade, we can look at what you need on the exam to achieve your goals. For example, if you are aiming for a minimum mark of 70 for the unit, and you’re sitting on 44.3, you need another 25.7 marks for the unit to make up the difference. Dividing that number by the exam weighting tells you what you need in the exam. 25.7 over 40 is 0.64, meaning you need a mark of 64/100 in the upcoming exam to achieve a minimum of 70 for the unit. Okay, cool. So what’s the strategy for uni exams? Fair question. Most people at uni full-time take four subjects per study period, so when we calculate our current marks for each of these four subjects, what we are trying to do is establish our priorities. Subject 1: Going really well, only need 54% on the exam to achieve an overall mark of 70. Subject 2: Going well, but need 75% on the exam to achieve an overall mark of 70. Subject 4: Sitting on 15 for the unit, but the exam is worth 70%, so 78% on the exam provides an overall mark of 70. Looking at all of this information, we can start to create an investment strategy. That is, given your goals, what does it make the most sense to put your time into? 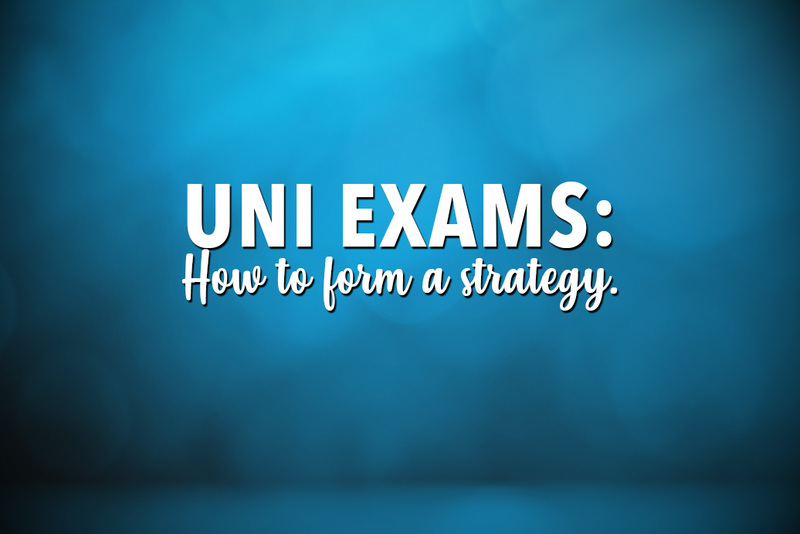 Some people will argue that you should study for all uni exams equally – but I think it makes a lot of sense to study for your uni exams unequally. You should aim to get the biggest return for the least amount of time. Subject 1, for example… It might not make a lot of sense to dedicate a huge amount of time to this subject when you only need 54% of the exam to achieve your goal. You might be able to achieve 54% on the exam without a big time investment. Subject 2 might demand that you do quite a bit of work to get the 75%, and that’s very achievable, so it makes sense to invest your time there. Subject 4 has a huge exam, so you should invest your time much more heavily in that subject that in Subject 1. Subject 2 could be controversial. If you’re confident you could scrape 50% with minimal effort, it might not make sense to invest a lot of time into it, given achieving your goal of 70 requires enormous effort. However, you must pass the unit, so depending on your confidence, perhaps you want to invest a significant amount of effort to ensure you get through. What the actual strategy should be… that’s up for debate and will be shaped by your goals and intuition. However, it should be clear to you that a) looking at your current grades, b) looking at exam weightings, and c) looking at what you need for your goals, can provide you with valuable information and may assist you in developing exam season strategy. Of course, also consider how soon particular subjects have their exam. Looking at your grades might suggest how much you need to study, but looking at your exam timetable will suggest when you should study, and in what concentrations. See what information you can glean from the university. Here, two things come to mind. First, the explicit things. What are the learning outcomes? What is listed in the course outline as important content? Who is making the exam? If it’s your lecturer, have they made any particular suggestions to you in lectures or tutorials? Second, what’s been tested already? Often, uni exams can focus on untested material. For example, if Assessment 1 tested Weeks 1-3, and Assessment 2 tested Weeks 4-7, there’s a chance the exam may focus more heavily on content taught from Weeks 8-12+. Obviously, this is a massive amount of conjecture, and you shouldn’t rely on this. Assuming things about the exam burns uni students every year. However, you may start to spot patterns in particular faculties or from particular professors, so keep your eyes peeled throughout the course of your degree. This is standard study advice, but it can become more relevant in uni. It’s not uncommon to skip lectures and say you’ll watch them later. Maybe you have a doctor’s appointment, maybe you slept in. Regardless, if you have basically never learned a section of the course, it’s probably pretty important that you brush up on that area before the exam comes rolling around. I’m stating the obvious in a big way, but plenty of students walk out of university exam rooms every semester mourning the fact that they forgot to catch up on what they missed and got sucked into the trap of studying what they knew. As always – good luck, fam! Remember, there’s an infinite amount of help available for you on the ATAR Notes Forums!